Not all wavelength regions of interest are directly accessible with lasers. Therefore, it is common e.g. to generate visible light by nonlinear conversion of infrared light from one or several lasers. Many but not all of these processes can be efficient only with phase matching and with polarized light. Laser radiation is usually polarized, but some devices (e.g. some high-power fiber lasers and amplifiers) do not emit with a stable linear polarization state and are therefore not very suitable for nonlinear frequency conversion. A pulsed (e.g. mode-locked or Q-switched) laser can have a peak power which is much higher than the average power. For single-frequency lasers and for mode-locked lasers, a resonant enhancement cavity can be used (→ resonant frequency doubling). Nonlinear conversion can also be done inside a laser resonator (→ intracavity frequency doubling). Another possibility is to increase the interaction length by using a waveguide (e.g. made of LiNbO3) or a fiber (the latter usually for χ(3) processes only). Particularly waveguides with small effective mode area can lead to high conversion efficiencies even with low optical powers. Applicable intensities are often limited by the damage threshold of the materials. There are situations where this limitation does not allow one to achieve highly efficient frequency conversion. An example is frequency doubling of ultrashort pulses into the ultraviolet spectral region, where the large group velocity mismatch limits the interaction length while the damage threshold is relatively low. The design of nonlinear frequency conversion devices can involve subtle issues. For devices based on parametric nonlinearities, there can be beam quality effects due to spatial walk-off, gain guiding, pump depletion and backconversion. Such effects can be investigated with numerical computer models, which can simulate the evolution of the spatial (and possibly temporal) profiles of the interacting beams. Particularly for the conversion of ultrashort pulses, there is a wide range of phenomena which should be properly understood in order to avoid a range of problems. The complexity of the nonlinear interactions, together with limitations of the available know-how in the photonics industry, is probably preventing many useful applications. For example, more dye lasers could be replaced with optical parametric oscillators. 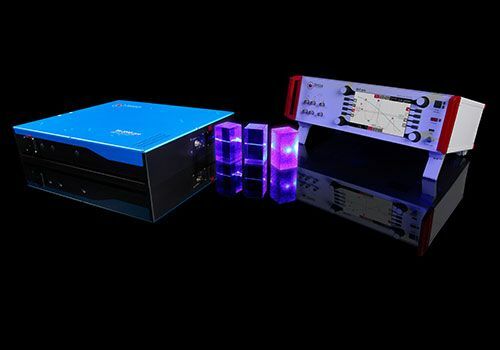 TOPTICA provides tunable continuous-wave laser systems including nonlinear frequency conversion for accessing the wavelength range from 190 nm to 4000 nm. The conversion processes are second-harmonic generation and optical parametric generation. We offer advice on all aspects of nonlinear frequency conversion, e.g. the design of frequency conversion devices, choice of nonlinear materials, simulation of nonlinear conversion. Also: specialized in-house training courses, tailored to your needs. Also, we offer optical parametric oscillators and amplifiers.